While Ella is worried about my parenting, Silas has other concerns. I was putting him to bed when he quietly asked, “Dad, if you die will I get all of your money?” I said, “Well, that depends, but why do you ask?” He said, “Oh, no reason. Don’t worry about it.” But now I’m worried about it. Like many couples, Jenny and I rarely feel a room is the same temperature. On occasional Sunday mornings I feel the worship center at church might be a little warm. I’ll whisper to Jenny, “How does the temperature feel?” If she says, “It feels great,” I know it is way too hot. With the kids being back at school, a series of sign-up sheets have come home for a variety of after school activities. Despite our best attempts to limit our family’s schedule, many events are already taking up our time. Most flyers end up in the trash before the kids even see them. I throw them away assuming what they don’t know won’t hurt them (by the way, my kids didn’t even know Disney World existed until this year). But there was one flyer I left out thinking Silas might be interested–the Boy Scouts. The second odd moment is a local tradition at funerals. In my hometown, it is the tradition after the ceremony to open the casket and allow everyone present to pay their respects to the deceased. Beside the casket and next to the flowers, the pastor traditionally stands. At a recent funeral, Jenny was seated on the back row. 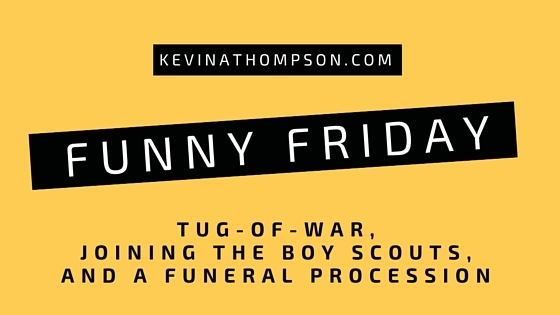 When the funeral ended, the funeral director escorted the crowd by the casket starting with the back of the funeral parlor and working his way forward. You’re a good writer, and a man with a great sense of humor.